This week I'm going to be bringing you the stages of the making of this piece with my usual M/W/F posts. There are a couple specific things that excite me about this picture one of them being I'm not sure I could have done it this time last year. In many ways I feel like I spent 2010 level-grinding and I'm just now starting to see the benefits. 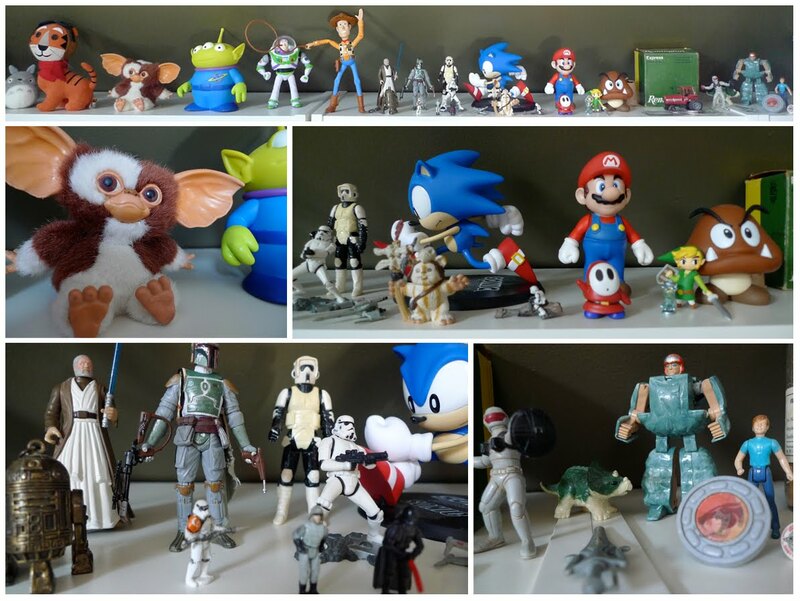 I'm a collector at heart. I love putting things on shelves and seeing them arranged. I'm certainly not in line with a minimalist design philosophy. I also rarely get rid of things. Unfortunately for me (though probably fortunately for the sanity of my wife) years back I participated in a giant yard sale. That's crazy you may think, that doesn't sound like you at all. You'd be right, except for the fact that this yard sale fell in that narrow window of time in my youth when $50 meant more to me than lots of small objects. 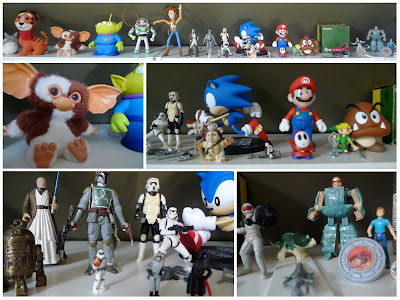 As a result I no longer have most of my childhood toys or any thing like that. No big loss you might think, and you may be right. Even so there are certain sounds, objects, and colors that can (to steal the phrase from a friend) "strike the tuning fork of my childhood." I think it's important not to lose those things, if not the actual object then at least the memories attached to them. There are a few pieces that somehow dodged this purge and I present them for your consideration today. In the beginning of the new year my wife and I overhauled my working space. She really did a number on it and as a result I have a much better way to display all of my things, let alone work. I'll post more on this transformation in the coming days. So, all that to say, here's some my stuff that's not stuff I drew. I hope you will enjoy. I'm still pretty much blown away that I got to do some real, live Fraggle art. Here follows an account of the project. I'm going to break it up in three parts, 1. How this project came about, character studies. 2. Thumbnails, roughs, and drawings. 3. Final art. One of the comments I've gotten several times on any of my sequential work is how people like the painting, the watercolor. I don't know if it's because comics aren't traditionally watercolored and it's a little novel or if it just happens to strike people or what but every story, comic I've done at some point I've gotten comments on the color work. So in my previous post I mentioned that I wanted to try something different for painting the piece this time. I typically just paint the drawing but this time I wanted to see how it might work if I didn't. Using the powers of a futuristic machine called a light box, lightly traced off my drawing ... and then, I painted pretty much what I thought I needed to. 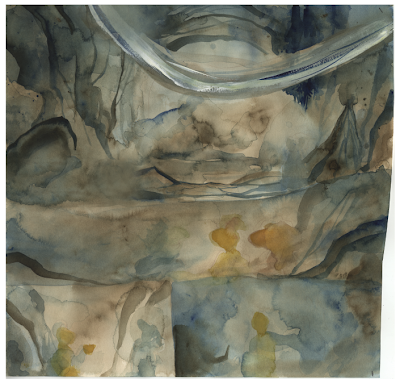 This let me keep my drawing as a drawing but I still got all my rocks and textures and watercolor-ness. From there I simply dropped the pencil back on top. It worked pretty well for what I needed and it was a good experiment. The coloring was pretty straightforward for me after that, I didn't do anything fancier that usual HOWEVER, I need to take a moment and thank my sister, Courtney. She is a genius and a super hero. She is the greatest. She did some flatting for me on this comic and it helped me out of a big time crunch. Anyway, she colored the main Fraggles (Gobo, Boober, and Wembley) for me with the specific colors they were supposed to be which let me tear through the final painting steps. I was able to focus on getting my watercolors and background paintings right and then finish the Fraggles. 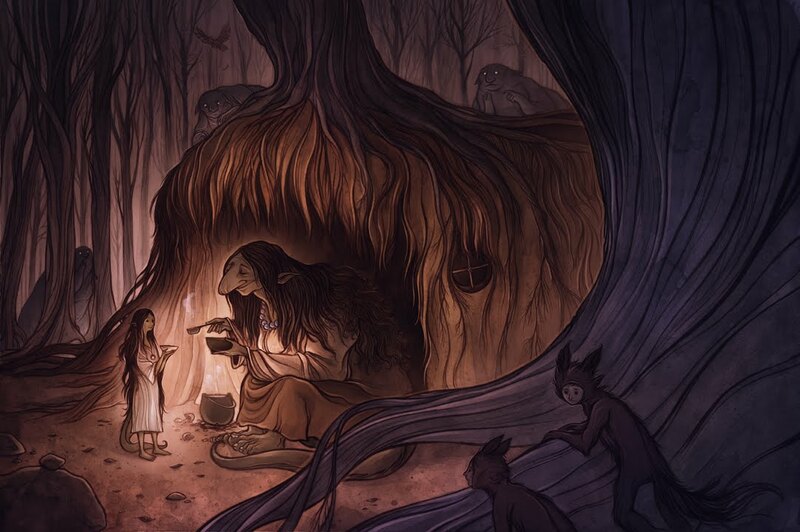 Basically,take all the pieces, final drawing, watercolor, flats, and put them together and then make it happen. Even so, it was tight getting the work done. I have not yet missed a professional deadline and I will break my neck to make sure I never do. The coloring for this story took me a 24 hour period. Just when I was considering taking a nap around 6AM (not really, but it makes this next part more dramatic) the dawn broke and sunlight began to fill my room. I checked Twitter to take my eyes off of the painting for a minute and lo, behold, what did I see. It was Jim Henson's birthday. September 24. 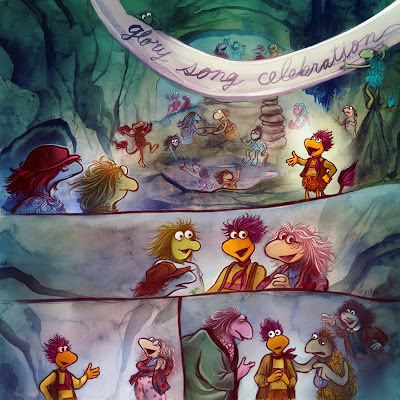 I was finishing this Fraggle Rock comic on Jim Henson's birthday. I discovered my powers renewed and pushed forward until the work was complete. I asked if I could hand letter the story but they wanted to keep the stories all consistent with one another, which makes sense, all the same they let me hand letter some shouts and sound effects which was a a lot fun. See below. After some time I received a PDF with the final text and everything laid in. It was awesome to see. This was an amazing experience and one that goes down in my book as a perfect project. 10/10. Every last aspect of the job was a pleasure. From the story, to client, to editor, to the reception of my work, everything last thing was great. As I understand it from the editor, my illustrations were not just approved but “enthusiastically approved” and that my work was some of their favorite Fraggle Rock pages yet. 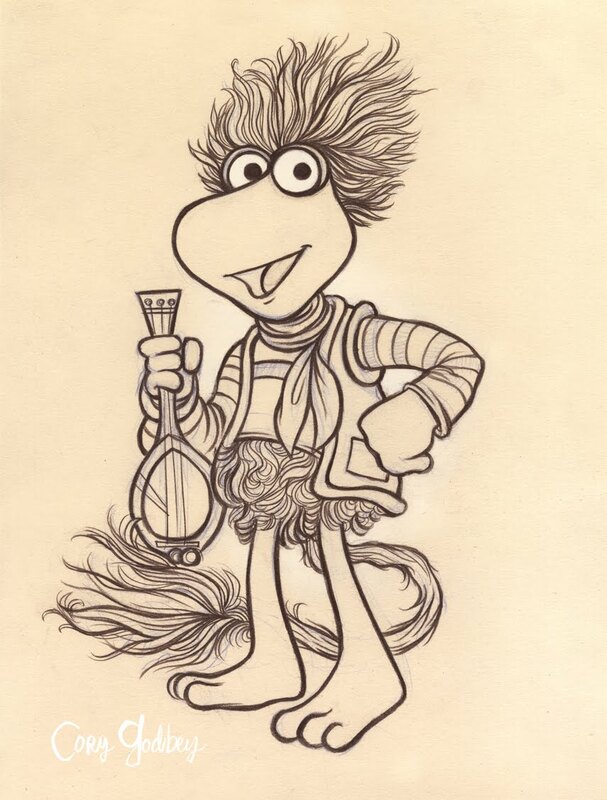 I am glad I was able to contribute to the Henson legacy even in this small way that I still can’t really put it in to words other than to say it was a perfect project. So I was officially approved by Henson. 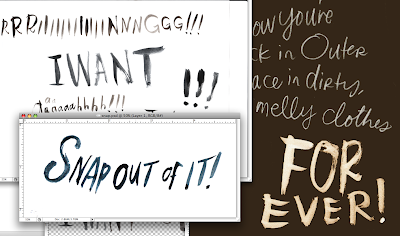 I didn't (and still don't) know if this meant that Fozzie Bear stamped my file with a big "WAKKA WAKKA WAKKA" or just someone, somewhere said, "He might not screw it up, ok."
Either way, I began working on the thumbnails, trying to figure out how to lay out the comic. This was my first time working from a script like this, for most all other comic work that I've done that's published I've written it and scripted it myself. In those instances I worked from a long rambling series of notes. This Fraggle script had panels and pages to figure. Well, I went to the beach. That's right, I first read the script and thumbnailed the pages while at the beach. It was great. But that doesn't really factor into things. 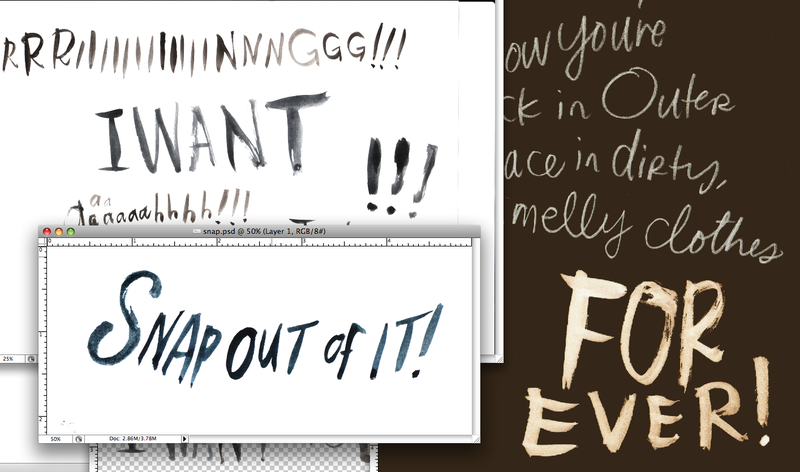 I then took my impossible to decipher thumbnails and made versions that I could show people. 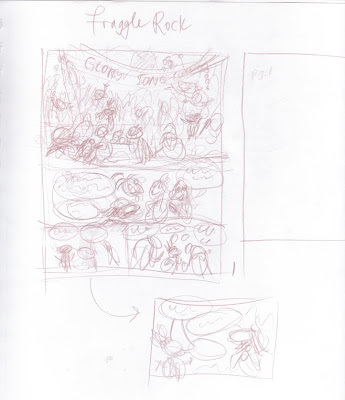 Basically I just took the scanned thumbnails and roughed them up in Photoshop. I worked with values and shapes, mostly. After this I laid in the text to get a feel for how the words would all fit. I was especially glad to hear that the roughs were approved, no changes, and I got to go to final. After this I did the drawings. I tried something a little different for this, you'll notice that there's almost no backgrounds or anything. I knew I was going to watercolor them but I had a different method I wanted to try for the final art. But that is for next time. Next post, Wednesday. 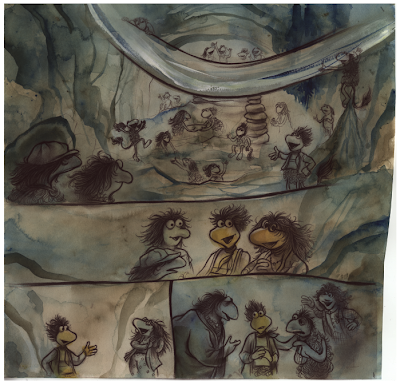 Watercolors, my super sister, final art, and Jim Henson's birthday. PS. Last time there was a question about the type of paper I use. For most all of my work I like a kind of printmaking paper, from The Graphic Chemical and Ink company. Here's a direct link to the paper, Natural White. Thanks to Jeremiah for the links in the previous post comment section! At Comic-Con 2009 I met Joe LeFavi, an awesome guy who worked for Henson and wore a Zelda t-shirt. 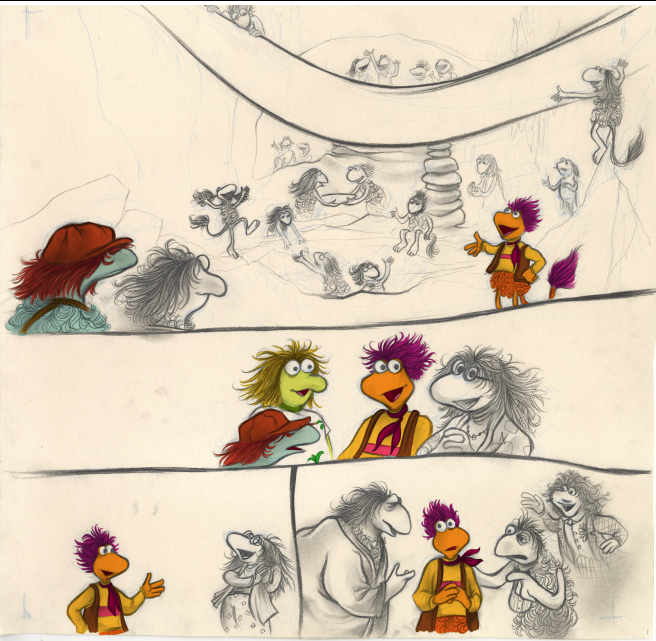 Fast forward a year and some months later and I'm illustrating the comic he wrote for the new Fraggle Rock anthology. As I understand it, my original comics in the Flight series (Vol.6 Walters, Vol. 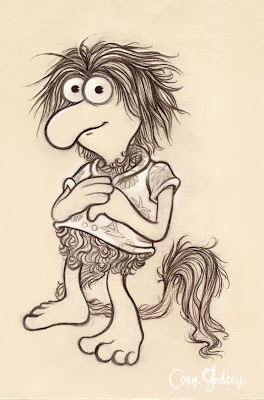 7 Onere and Piccola) gave someone important enough confidence to give me a chance to do some Fraggle work. I got an email from the editor, Tim Beedle asking me if I would be interested in the project. Well, yes, I was very interested. After some time I was asked to do some character art, basically Fraggle studies, to become officially approved by Henson. 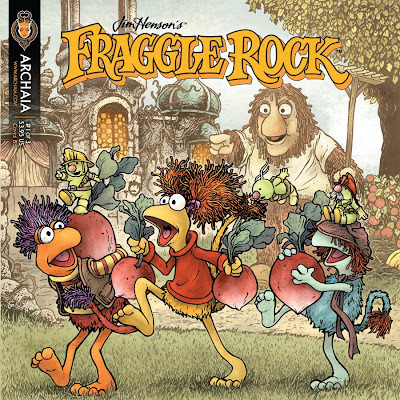 Truthfully (and I still don't know how) I missed Fraggle Rock as a kid. 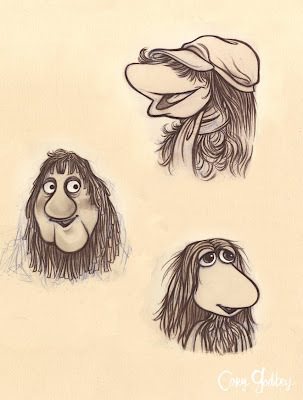 I loved the Muppets, and Sesame Street, especially, but incredibly I don't ever remember watching Fraggle Rock. 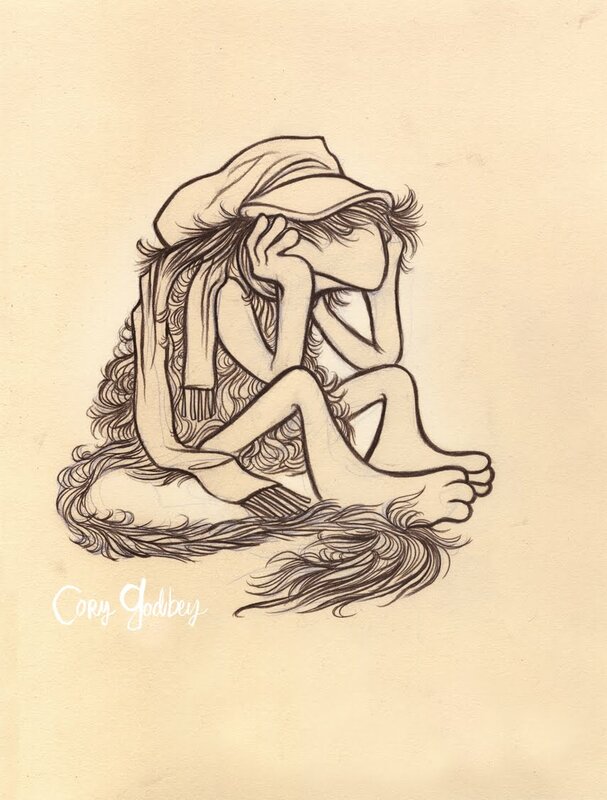 For this stage then I needed to figure these Fraggles out. I went and watched a bunch of episodes from the first season, read up on the series, and studied the characters. I'm sorry it took me so long to meet the Fraggles. After I began to do the character art it struck me -- I might have been born to draw Fraggles. Their hair, tails, everything, they're a great combination of a lot of things I like to draw. Here are the samples I turned in. 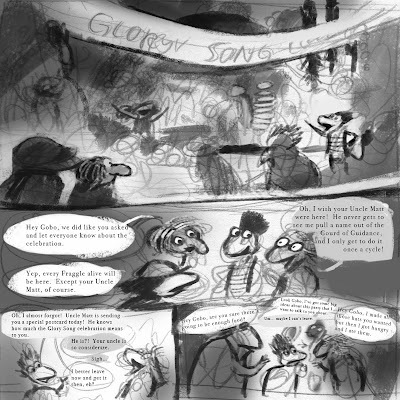 So after this point I was approved by Henson and I then took the script and began to thumbnail out the pages. But that's for next time. Next post, Monday. 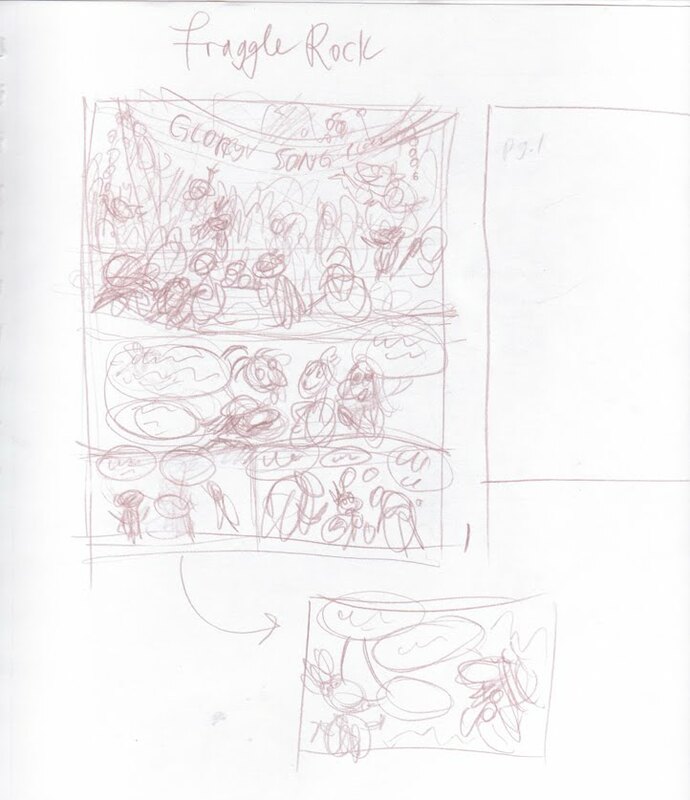 Thumbnails, roughs, and drawings. Cover by David Petersen of "Mouse Guard" fame. Last September I got a dream job. I got to work on the new Fraggle Rock comics. Needless to say the chance to do some work for The Jim Henson Co. blew me away. 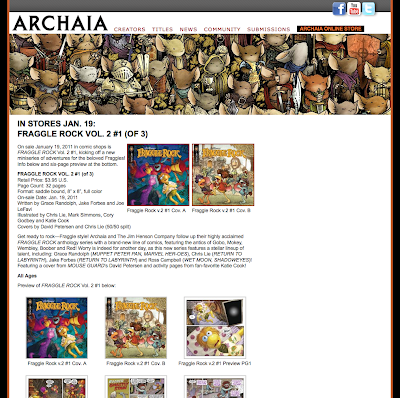 Today the comic is released and I'm pleased to share some of it with you here. 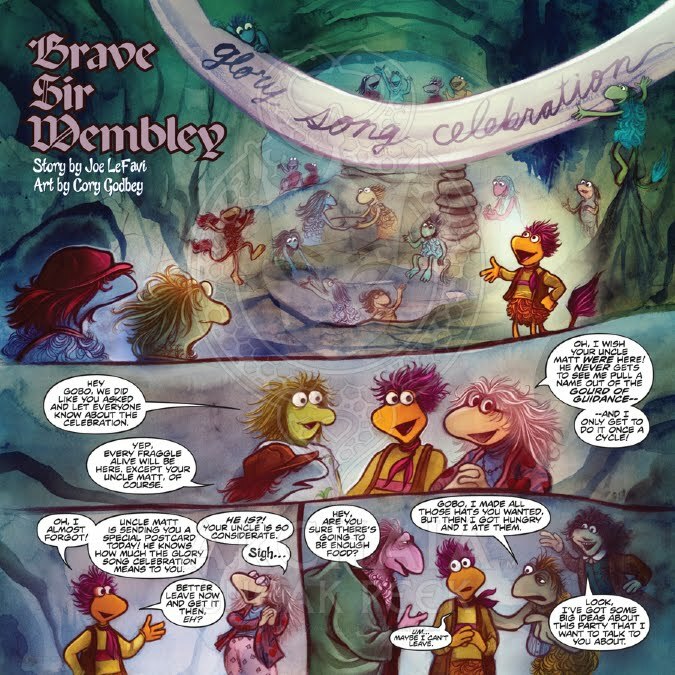 This is the part I was most pleased with – as I understand it from the editor, my illustrations were not just approved but “enthusiastically approved” and that my work was some of their favorite Fraggle Rock pages yet. I am so excited to be able to contribute to the Henson legacy even in this small way that I still can’t really put it in to words. It was a perfect project. 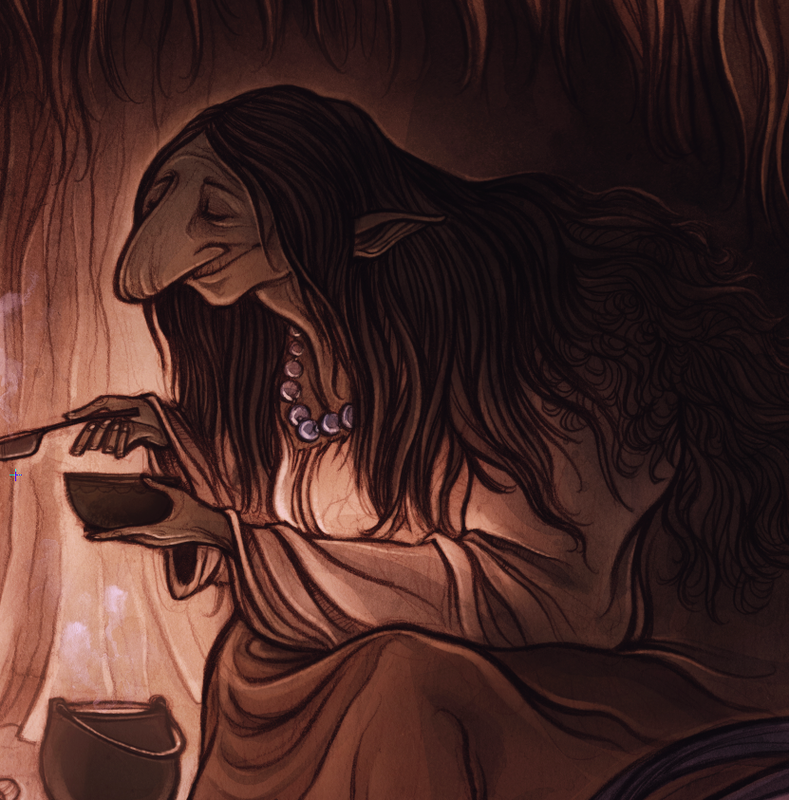 as well as a preview of the rest of the book here. Next time I'll post some of the development work I did for this project. And hey, I'm finally back with my regular blog updates. Several year end of 2010 and beginning 2011 projects waylaid me for a bit but I'm back with M/W/F updates.